A commercial space plane designed to carry astronauts and cargo into Earth orbit will soon touch down in stores as a popular toy. Sierra Nevada Corporation (SNC) announced on Monday (Sep. 17) that its Dream Chaser spacecraft will be part of Mattel Inc.'s Matchbox Sky Busters toy line to be released this month. "My curiosity for space started young, and I hope this helps spark the same in any kid who has this toy," Steve Lindsey, vice president of SNC's Space Exploration Systems and a former NASA astronaut who commanded three of his five missions on the space shuttle, said in a statement. "There's just something about a winged spacecraft that spurs the imagination." Like the classic Matchbox toy car line that features die-cast scale models of real-life wheeled vehicles, Sky Busters has offered the same for winged aircraft since 1973. The Matchbox Sky Busters Dream Chaser reproduces the SNC space plane as a 3.5-inch-long (9-centimeter) toy approximately 1:100th the size of the actual orbital craft. Remember those science-fiction movies where the United Nations was calling the shots in space? We may be one small step closer to that scenario. Today the U.N. Office for Outer Space Affairs, or UNOOSA, called on its member states, and particularly developing countries, to come up with suggestions for 20 to 30 payloads that would go on an orbital space mission it’s planning with Sierra Nevada Corp. SNC would fly the payloads — which could include scientific experiments as well as deployable satellites — aboard its Dream Chaser space plane during a two- to three-week flight. 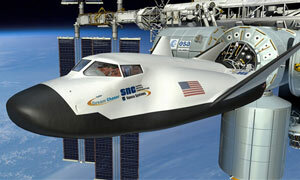 NASA has revealed its new reusable space vehicle, the “Dream Chaser”. The new spacecraft follows in the footsteps of its previous generation which was partially reusable. The craft is in its early test phase and more tests will start before the end of 2017. Once fully developed, the vehicle will be used to deliver cargo to the International Space Station (ISS). Researchers hope its first delivery can happen within the next few years. Sierra Nevada Corporation has selected United Launch Alliance’s (ULA) commercially developed Atlas 5 rocket to launch the first two missions of its Dream Chaser cargo system in support of NASA’s Cargo Resupply Services 2 (CRS2) contract. The two Atlas 5 missions will carry pressurized and unpressurized cargo to the International Space Station (ISS). CENTENNIAL, Colo., July 19, 2017 /PRNewswire/ -- Sierra Nevada Corporation (SNC) announced that it selected United Launch Alliance's (ULA's) commercially developed Atlas V rocket to launch the first two missions of its Dream Chaser cargo system in support of NASA's Cargo Resupply Services 2 (CRS2) contract. "ULA is pleased to partner with Sierra Nevada Corporation to launch its Dream Chaser cargo system to the International Space Station in less than three years," said Gary Wentz, ULA vice president of Human and Commercial Systems. "We recognize the importance of on time and reliable transportation of crew and cargo to Station and are honored the Atlas V was selected to continue to launch cargo resupply missions for NASA." Sierra Nevada Corp. announced recently it will launch its first unmanned orbital test fight in 2016, an effort meant to prove its Dream Chaser is capable of shuttling astronauts to and from space. The flight is currently scheduled to launch on Nov. 1, 2016 from Cape Canaveral, Fla., and will sit piggyback on a United Atlas 5 rocket. While the Dream Chaser’s first flight will be unmanned, the plan is to eventually shuttle astronauts into low-Earth orbit by 2017 using the private space plane.